Are you looking to better understand your fans? When you collect data from your fans, you can make your products better and improve customer service. In this article I’ll share three ways to use social media to gather leads and insights from your fans. Social media campaigns not only improve your reach and extend your brand recognition, they collect information you can use to improve current products, create new ones and stay in better touch with your fans. Campaigns range from Facebook apps and promotions to landing pages, online offers, data forms, RSS feeds and more. Use campaigns to gain a wealth of information to enhance your customers’ experience. Here are three types of social media campaigns you can create, as well as the types of information you can gain from them. Each of these campaigns can be created using third-party campaign-building software. The easier you make it for your online audience to book an appointment with your business, the better. Reservation forms can be simple, including just the customer’s name and desired reservation time. However, if someone has made it as far as your online reservation form, he or she is probably already a customer. Take the opportunity to learn what your customers like about your business that keeps them coming back. 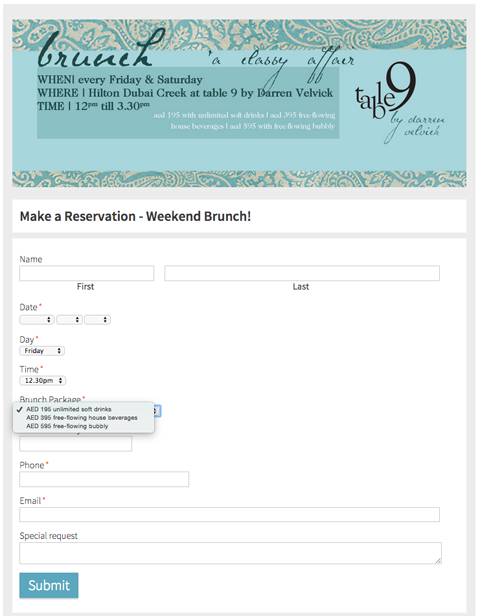 For example, Table 9 uses their Facebook reservation form to learn what their fans want out of a weekend brunch. The restaurant offers a special add-on to each brunch: unlimited soft drinks, free-flowing cocktails or bottomless bubbly. When accepting a customer reservation, Table 9 asks customers for their name, date and time they’d like to make a reservation, as well as which type of brunch special they want. If after a few weeks Table 9 notices a majority of people choose the free-flowing bubbly and no-one opts for the soft-drinks special, they’re able to adjust their future brunch menu (and special offerings) accordingly. Table 9’s main goal is to drive foot traffic to their Sunday brunch. However, they use social media to learn about their customers’ wants and needs. 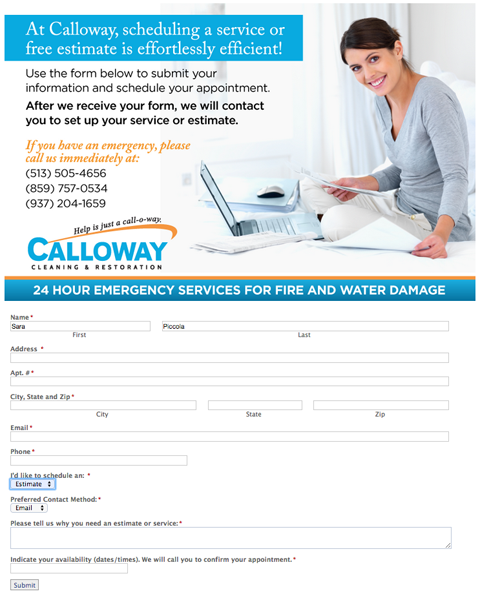 Calloway, an emergency water and fire damage service, uses their Facebook appointment form to gather customers’ contact information, as well as details about why they need an estimate or service. The details make service more efficient, while giving Calloway ideas of what content to create for their fans. If a majority of their customers request appointments to help deal with accidental fire damage, then Calloway needs to educate their social followers about fire safety. They could share content that provides guidance on how to prevent home fires and what to do in case of a fire emergency. By offering their appointment form online, Calloway streamlines customer services and frees up their phone lines. They’re also able to learn about the types of customers they’re receiving in order to do additional outreach and drive more business. Have you ever bought a product at the grocery store after tasting a small sample, even though the product wasn’t on your shopping list? Sampling is a sales tactic that works and it’s easy to turn it into a social media campaign. Create a social media campaign that’s a giveaway featuring new products. Offer a coupon or free samples to your fans in exchange for valuable data. Or do a sweepstakes and give the freebie to a certain number of winners. La Tortilla Factory used Facebook to announce a new tortilla flavor they wanted their online fans to try. For this campaign, they gave away five packets of tortillas to five winners each week throughout September. Fans who entered could check a box to receive more information and deals. 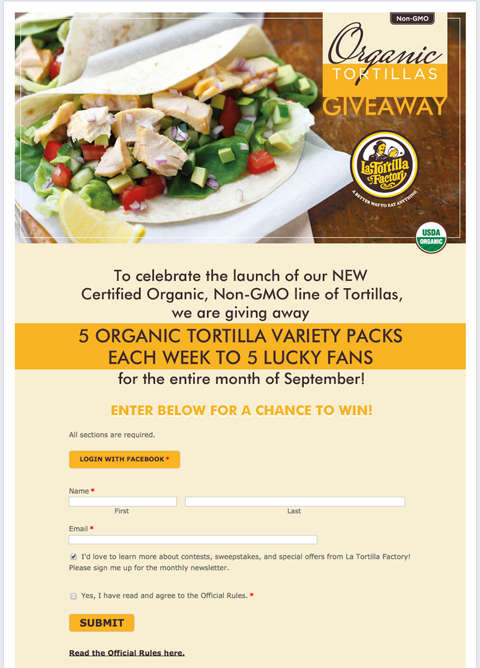 La Tortilla Factory collected the email addresses of their entrants to open lines of communication through email marketing. Later, they could also send a special coupon, survey or other purchase incentive to anyone who had entered. Social-specific campaigns help determine which social network converts the most sales from fans. Run offers at different times on a variety of platforms and compare the results. Use this research to decide where to advertise and where to inform. If you have a lot of Facebook fans, but they aren’t purchasing from you, a Facebook-only offer may increase your likelihood of converting them into customers. 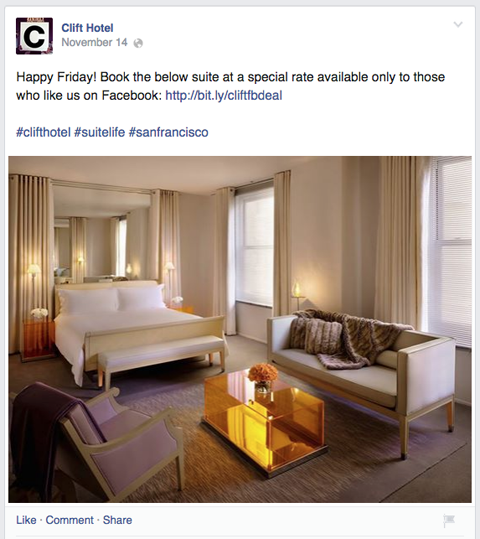 In this example Clift Hotel offered a special rate on suites just for their Facebook fans. The Facebook post linked to a special landing page where the hotel could track reservations and compare them to the clicks they received on their Facebook post. Clift Hotel could offer this special at different times exclusively to their different social media audiences and compare the results. If after testing different campaigns you find your Google+ audience is more likely to buy than your Facebook audience, then adjust your content to suit them. 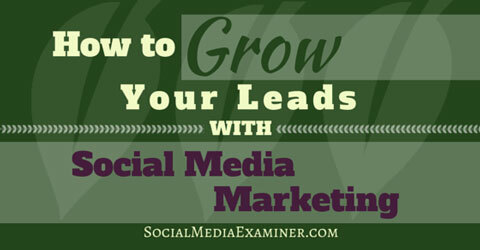 Create more “salesy” messages for Google+ users and more educational content for your Facebook fans. Every action a business takes on social media is an opportunity to learn from followers. While one of the main goals of social media is to collect leads in the form of email addresses, there is plenty of additional data that can be collected to help convert those leads into sales. Find unique ways to learn about your customers, so you can use that information to personalize your offerings. Social media campaigns do not need to be limited to promotions or giveaways. The next time you want to learn from your social audience, get creative with the kinds of campaigns you can use to collect information.